Snow showers visible from the top of Blount Mountain near the community of Straight Mountain, Alabama. For those that have done the Tour de Blue, this is the overlook that is used as a rest stop just past Walker Gap. During my Sleeping Giants adventure last week, I rode in shorts and a short sleeve jersey unzipped because the temp got up into the 70s even with the rain. Yesterday, exactly one week later, the temperature stayed in the upper 20s all day except towards the end when the sun came out and I experienced some of the heat island effect of Birmingham. During the ride, I was also able to experience something that doesn’t happen very often here in Alabama – intermittent convective snow showers. These are basically the same thing as summer rain showers, except with snow instead. In between the showers were very brief periods of blue sky and sun as well as gray overcast skies. The pic above is from the top of Blount Mountain after climbing up US Hwy 231 in a snow shower (video below). Note how you can see two distinct snow showers obscuring different parts of the valley and ridges below. My goal for this ride was to head northeast of Birmingham because that is where the most snow was going to be. Unfortunately, I didn’t have enough time to make it all the way up to Lookout Mountain, so I settled for Chandler Mountain, which at 1500′ would have the highest chance of accumulating snowfall. There wasn’t a lot of snow in any one of the showers, and I don’t think it had snowed at all when I climbed up the 1 mile Cat 3 Chandler Mountain wall used as the finish of the Sumataunga Training race series. I turned around at the top and decided to head back all the way across Pine Mountain / Straight Mountain / Blount Mountain to get back to Birmingham. This really long mountain has a lake in the middle of the mountain called “Inland Lake”, and I noticed the turn for the east side boat ramp, which I plan to explore on another ride another day. In the meantime, check out the maps and pics from the ride. 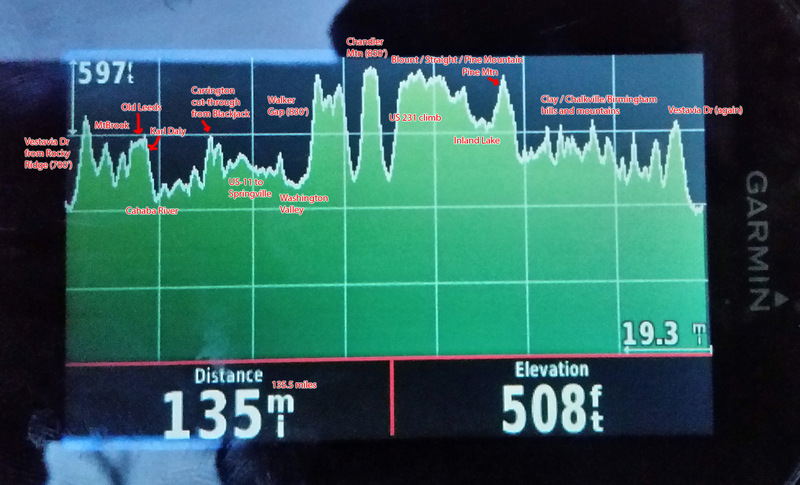 Annotated Garmin 1000 elevation profile – interesting to compare the relative size of climbs (particularly Vestavia Dr, Karl Daly, Walker Gap, Chandler Mountain, and US 231). Click to enlarge. Tri-county annotated topocreator map of the ridges and valleys on this ride. Click to enlarge and see detail. Abandoned water tower climb across the valley from the cell tower climb. Downtown Birmingham in the distance, January 2012 tornado damage path in the foreground. It has been a while since I last climbed 18,000 feet. This was a great adventure in the snow – will write up a blog about it soon. 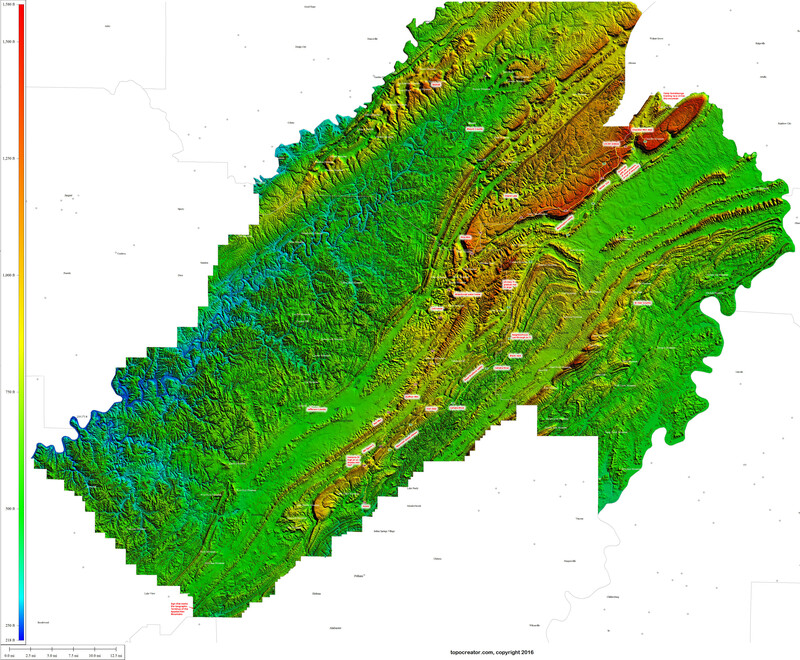 This entry was posted in Adventure, Training and tagged maps, snow on February 11, 2016 by kartoone.